Often, content, documents and knowledge is stored or archived in your eMail inbox including attachments. PST and OST are the Outlook data files acting as database to organize your eMail content. 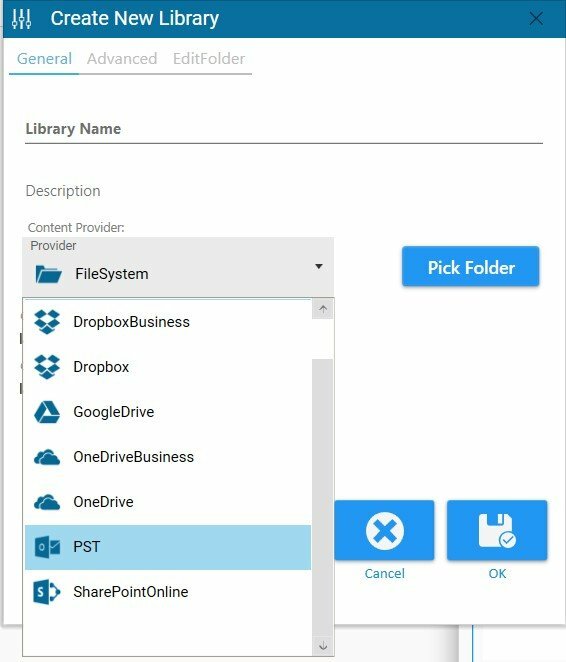 Individual PST or OST files hold your history of eMails and attachment. A search in outlook pst data files could be a great benefit to quickly browse your mail archives. The good point is, that Noggle can completly index and integrate your PST outlook files into the Noggle search application. Noggle indexes eMail content including a full text and/or OCR scan of all attachments. This allows you to retrieve all emails and documents right from your Noggle search application. Just add a new library with the PST source selection. Open the library manager rom the left main menu panel. Select the “+” button to create a new library on the right library manager panel. You can also diretly open found eMails or attachments from within the Noggle client. No need to import your PST file into Outlook – simply use Noggle to search and retrieve important knowledge out of your existing PST files.